While in the mid-twentieth century many young women continued to pursue the dream of a white wedding, complete with a full-skirted Cinderella gown, Dawn ‘Velma’ Harris of Auckland was not amongst them. 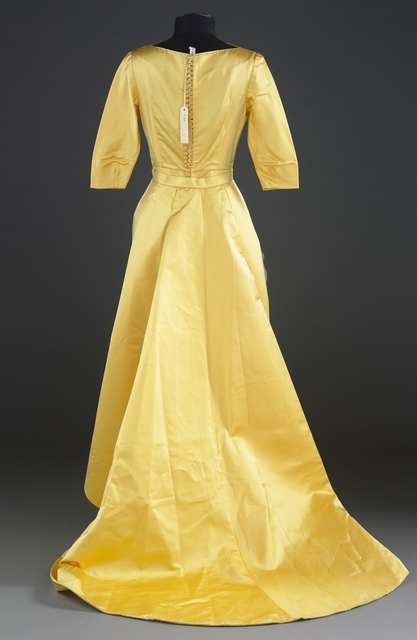 When she married James Turner on 27 May in 1961, she walked down the aisle of St Andrews Church in this eye-catching – and for some eye-brow raising – ensemble in glowing, yellow Thai silk. The ensemble, which surprised some of Velma’s more conservative family members, is both dramatic and practical. The drama is provided by a removable over-skirt, the back of which forms a train. The over-skirt forms a train at the back. The practicality by the elegant and very wearable knee-length dress, suitable for After Five. For the wedding the two were seamlessly joined by a bead-encrusted belt with bow. The ensemble, completed by a dainty custom-made crown and veil, was designed and constructed by Beverley Gordine, a close friend of Velma’s. Beverley had begun her career as a dressmaker in Vulcan Lane, Auckland’s fashion quarter, in the 1930s. Although not formally trained, she had a flair for cutting and reproducing garments in the style of overseas fashions and was an excellent hand sewer. In particular she excelled at fine beadwork and the grafting of lace. Stylish Velma teamed the dress with a pair of golden heels by Sbicca of California, which in keeping with the dress also featured a flourish of beads. Shoes by Sbicca of California, 1961. Gift of Velma Turner. Following the marriage service, the newly wed Mr and Mrs Turner and their guests adjourned to the Orchid Room, a popular venue in Mount Eden, for their reception. At some point in the proceedings, Velma slipped out of her wedding dress into her equally interesting ‘going-away dress’ (below), also designed by Beverley Gordine. Drawing on her talent, and patience, for handwork, Beverley adorned the collar and cuffs with intricate trails of rouleau. She also made rouleau loops for the rows of self-covered buttons. Detail of Beverley Gordine’s rouleau work. Rouleau is derived from the French ‘roule’, meaning roll. Velma’s wedding ensemble and going-away dress will be on display from Saturday 25 February opposite the exhibition New Zealand in Vogue on Level 4 of Te Papa. Velma Turner gifted both dresses, along with a copy of her wedding invitation and wedding portrait, to Te Papa in 1986. ‘Wedding Dress of the Week’ is posted in conjunction with the exhibition Unveiled: 200 years of the Wedding Fashion from the Victoria and Albert Museum, London which is on display at Te Papa until 22 April. Thank you. Its lovely to know people are reading and enjoying. The more we can get our collections out there, the better! I really enjoy reading your blog!You have so many classical dresses and shoes!Thanks for sharing!I love it!